Founded in 2007 by Modern Pentathlon Olympic Medallist and World Champion Joël Bouzou, Peace and Sport is a neutral and independent worldwide organization that is operational in using sport and its values as an instrument for peace. The use of sport as a pedagogic tool has motivated the international sports movement into tangible action. 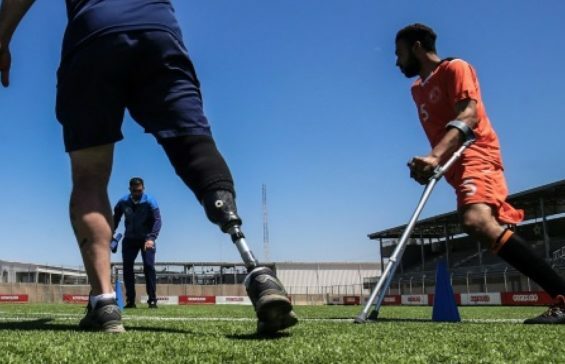 In parallel, our success in the field has made political leaders and governments aware of how sport can be a genuine and effective mechanism for peace. Furthermore, we are increasingly working with international companies, to encourage them to integrate sport into their social responsibility and local policies. Joël Bouzou is the President and Founder of “Peace and Sport, L'Organisation pour la Paix par le Sport” and the President of the World Olympians Association. I am proud to bring my High Patronage to ‘Peace and Sport, l’Organisation pour la Paix par le Sport’ a humanist initiative that through sport, promotes a spirit of civic-mindedness, of dialogue and of acceptance necessary to ease tensions and establish peace in the world. Confronted by major crises linked to the trauma of armed conflicts, extreme poverty or the deliquescence of social ties, we have a collective obligation, even an urgent duty, to act in order to improve the quality of life of millions of men, women and children whose suffering is a blemish on the advancement of our century. In this uncertain world, sport and the rules of sport are a source of stability, education and integration for young people in vulnerable situations, thanks to the values of sharing, tolerance, respect and loyalty that it generates. Since its inception in 2007, through daily action Peace and Sport has demonstrated the utility of a neutral platform capable of uniting and federating a multitude of decision-makers in politics, sport, economic and civil life around this conviction. By fostering concertation between these actors, Peace and Sport helps to turn sport into an efficient lever to aid the emergence of sustainable peace in areas of the world that most need it, and to offer new horizons to those for whom the future seems obscure. More than ever, confronted with the enormity of need, Peace and Sport’s action is useful and necessary. I am convinced that this organisation, driven by a spirit of generosity and solidarity, brings vulnerable communities the possibility to surpass their differences and contribute to shape a more unified, more peaceful world, concerned with preserving the dignity of each and every man and woman. Founded in 2007, Peace and Sport is the Monaco-based organization under the High Patronage of H.S.H. Prince Albert II. Its objective is to bring the structuring values of sport to the heart of communities in crisis throughout the world, making sport a vehicle for tolerance, respect and citizenship at the service of sustainable peace. The backbone of its action is a group of over 80 high-level athletes, called “Champions for Peace” who dynamically support the organization’s activities at all levels. In November 2011, Joël Bouzou was elected President of the World Olympians Association (WOA), the only international organization which unites all of the 100,000 athletes from 145 countries to have competed in an Olympic event. Current President of the French Federation of Modern Pentathlon, Vice President and former Secretary General (1997 to 2012) of the Union Internationale de Pentathlon Moderne (UIPM) and a highly accomplished Modern Pentathlete himself, Joël Bouzou has participated in four Olympic Games (Moscow 1980, Los Angeles 1984, Seoul 1988 and Barcelona 1992) winning a bronze medal during the 1984 Games.He won the World Championship title in Modern Pentathlon in 1987. In 1991, Joël Bouzou founded the association “Rassemblement par le Sport” (“Together through Sport”) and created the “Champions in the Street” program, which helps the social insertion of young people through sport in city suburbs, using champions as role models. A French national, Joël has been awarded the Legion of Honour (the highest decoration in France), and the National Order of Merit. He has also been decorated with the French medal ‘Médaille d’Or de la Jeunesse et des Sports’ (‘Gold Medal for Youth and Sports’). Joël Bouzou is currently Advisor to H.S.H. Prince Albert II of Monaco, Administrator of the A.S. Monaco Football Club and Member of the IOC Sport and Active Society Commission. Peace and Sport brings together a team of “Champions for Peace”, top-level sports champions who are either still active or have retired from their sports career who wish to help disadvantaged communities through sport. They are role-models, heroes and a source of inspiration for young people throughout the world.